A few years ago, plans were announced for a life-size replica of the Titanic, the luxury ship whose sinking inspired a very expensive movie and some great blogs. On Wednesday, construction of the large fake boat finally began. 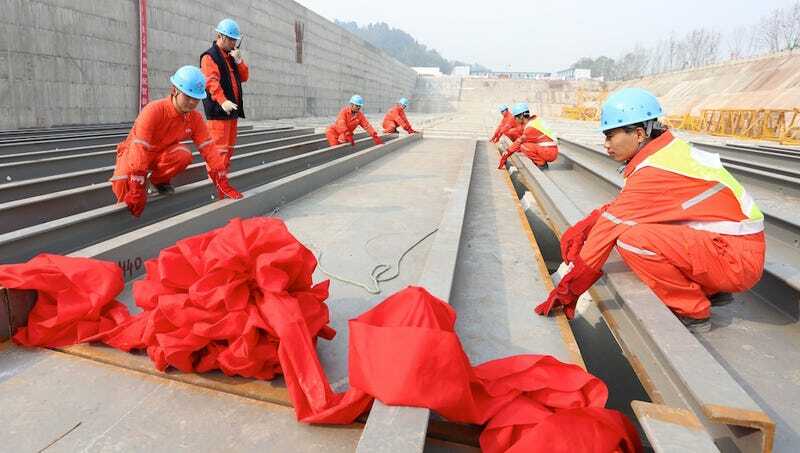 The South China Morning Post reports that the second iteration of one of the most notable disasters in human history is currently taking shape in China’s Sichuan province. It started “with a keel-laying ceremony and fireworks to mark the occasion,” and total construction will cost roughly $145 million. It’s slated for completion in 2017, though according to the Chinese government, it could be another 2.5 years before we see the fruits of this labor. Visitors can take part in period-correct parties and games, and even the banquet menu would be “exactly” the same as it was a century ago. With the aid of a high-tech simulation re-enactment, visitors can experience some of the horror the passengers must have felt when ocean liner began its decent into the north Atlantic. According to Curtis Schnell, the project’s alleged “Titanic design expert,” the project is aiming for authenticity. According to the South China Morning Post, the cheapest option “for a night on board” will cost about $435, while the more expensive option will run into the thousands.